The Global Volcanism Program has no activity reports for Colachi. The Global Volcanism Program has no Weekly Reports available for Colachi. The Global Volcanism Program has no Bulletin Reports available for Colachi. The Global Volcanism Program has no synonyms or subfeatures listed for Colachi. 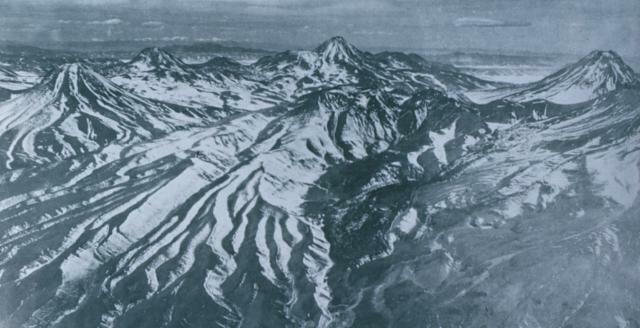 Colachi is a andesitic-dacitic stratovolcano that was constructed on an uplifted block of welded ignimbrites. The most recent activity produced pristine silicic lava flows of probable Holocene age, the largest of which covers a 7 km2 area on the saddle between Colachi and the neighboring volcano of Acamarachi (de Silva and Francis, 1991). A smaller flow was erupted on the W flank. The closely spaced Colachi and Acamarachi volcanoes represent different magmatic systems (Gardeweg 1993, pers. comm.). The Global Volcanism Program is not aware of any Holocene eruptions from Colachi. If this volcano has had large eruptions (VEI >= 4) prior to 10,000 years ago, information might be found on the Colachi page in the LaMEVE (Large Magnitude Explosive Volcanic Eruptions) database, a part of the Volcano Global Risk Identification and Analysis Project (VOGRIPA). There is no Deformation History data available for Colachi. There is no Emissions History data available for Colachi. Colachi (left) is an andesitic-dacitic stratovolcano whose most recent activity produced pristine silicic lava flows of probable Holocene age. The largest of these covers a 7 sq km area on the saddle between Colachi and the neighboring volcano of Acamarachi (center horizon). 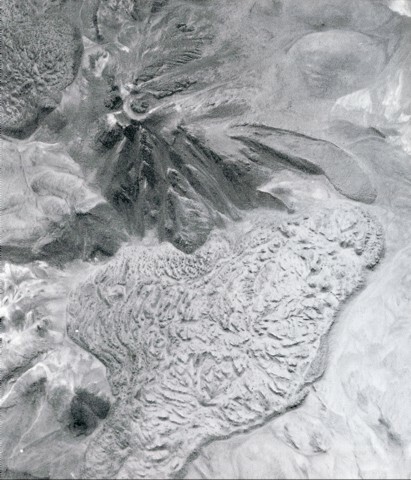 This aerial view from the west also shows the conical peak of Aguas Calientes (far right), a twin volcano of Lascar volcano, whose slopes appear at the lower right. The Talabre valley in the center foreground is partially filled by an andesitic lava flow from Lascar. Photo by Insitituto Geográfico Militar, courtesy of Oscar González-Ferrán (University of Chile). Two youthful large silicic lava flows flank the summit of Colachi volcano (upper left). The larger flow (bottom) covers a 7 sq km area at the SE base of the volcano. The smaller flow on the NW flank is visible at the upper left. A smaller lava flow with pronounced lateral levees was erupted from a vent on the eastern flank. There are no samples for Colachi in the Smithsonian's NMNH Department of Mineral Sciences Rock and Ore collection. Large Eruptions of Colachi Information about large Quaternary eruptions (VEI >= 4) is cataloged in the Large Magnitude Explosive Volcanic Eruptions (LaMEVE) database of the Volcano Global Risk Identification and Analysis Project (VOGRIPA).